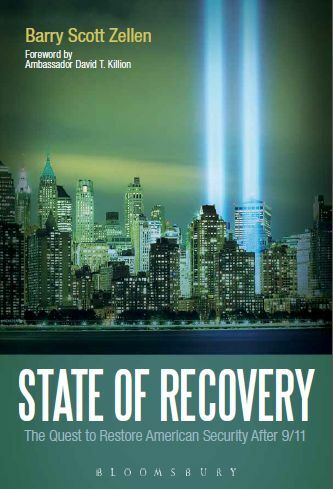 In January 2013, Zellen published his tenth monograph, State of Recovery: The Quest to Restore American Security after 9/11 (Bloomsbury Academic). It's a retrospective on the ten years of technology and policy innovation that followed the September 11 attacks, as technology, security and policy professionals came together to redress the many homeland security challenges confronting America after the Twin Towers fell. Reviewed by Richard English, Wardlaw Professor of Politics in the School of International Relations, and Director of the Handa Centre for the Study of Terrorism and Political Violence (CSTPV), at the University of St Andrews in the Journal of Terrorism Research (JTR), Volume 5, Issue 2 (May 2014), p59-61, http://ojs.st-andrews.ac.uk/index.php/jtr/article/view/883/731. ‘Technology to the Rescue.’ Barry Scott Zellen’s intriguing and impressive new book examines the deployment of technological innovation by the United States, as it has attempted to ensure its security from threat after the atrocity of 9/11. In the words of Zellen’s own manifesto here: ‘State of Recovery examines the numerous efforts by technologists and homeland security policy makers dedicated to restoring security and ameliorating the insecurity felt after the attacks more than a decade ago.’ It is a fascinating account. The author considers the dramatic US rise in technology spending, both public and private, since 2001; he assesses the remarkable innovation evident in recent years in biometrics, in information security, and in protection regarding aviation, underground travel, sporting events, food, and the mail system, as well as the reorganization (with the Department of Homeland Security and so forth) of US structures of prevention; he ranges widely over non-terrorist dangers, such as those posed by hostile states (North Korea, Iran), by illegal migration into America, and by increasing border violence. Zellen is an admirably prolific and highly intelligent scholar. Here, he recognizes that some measure of insecurity and threat will prove residual. And some very good points are made. One of the repeatedly important lessons which emerges from this thoughtful book is the constant need for ensuring intra- and inter-state coordination, cooperation, and partnerships (together with organizational streamlining). Regrettably, it is an insight more easily stated than it is adhered to in effective manner. "Zellen effectively comingles two important factors, promises of technological advances and engineering security for all Americans in the terrible and long struggle against global terrorism. Apparently the American policies and innovative technologies have succeeded in preventing an attack on the homeland for more than a decade. That provides some comfort, but an insistence prevails that work continue. It isn’t as simple as killing secular or theocratic dictatorship; for example, 'rather than good triumphing over evil, the Iraq war has unleashed long suppressed forces of terror and nihilism, initiating its own cycle of violence.' It is thus necessary to recognize the complexity and multiplicity of conflict that divides our world into friends as foes. This study will inform and advise us into the future." "State of Recovery provides a much needed comprehensive and informed assessment of the role technology and innovation plays among U.S. adversaries in their efforts to undermine U.S. national and international security interests. Barry Zellen further provides an insightful look into what the U.S. is doing, through its own employment of technological means, to combat or circumvent adversarial efforts. Rooted in his exhaustive and astute understanding of this complex issue, his three-dimensional look goes a long ways toward filling a significant void in this body of literature." "If you have an addiction for the writings of P.W. Singer on the impact of technology on national security, or Benjamin Sutherland who writes about impact of technology on defense, society, and the economy for The Economist, you will enjoy immersing your mind with Barry Zellen's, State of Recovery. It is a multi-disciplinary look at how technology has changed the United States, her allies and her adversaries, coupled with how the militant Islamist adversary, like al-Qaida, has adapted using technology. If you wanted to delve into how al-Qaida went virtual and the new battlefield of cyberwarfare, this book will leave you hungry for more." —CDR Youssef Aboul-Enein, USN, National Defense University's Eisenhower School for National Security and Resource Strategy. Author, Militant Islamist Ideology: Understanding the Global Threat, and Iraq in Turmoil: Historical Perspectives of Dr. Ali al-Wardi from the Ottomans to King Feisal. "In this wonderfully detailed historical mosaic, Barry Scott Zellen recreates the fascinating but often unsung efforts by thousands of America's technology and policy professionals who worked to restore homeland security after 9/11. Their mission - outsmart a new opponent in this epic struggle that defines our age. A must read for security and technology professionals, and for anyone recalling those darkest of days after the attacks on New York and Washington. It is a tale of overcoming fears, restoring hope and the erasure of America’s collective state of despair." "Barry Zellen has put together a comprehensive look at the possible avenues we could take, and which ones we should. He turns up the resolution a bit higher on the great issues facing post-9/11 America. A must on the bookshelf of any student, researcher, or teacher of current and future American security strategy." "Zellen provides a compelling analysis of the role that technology played in restoring security in an America where peoples' worldview was fundamentally altered by the attacks of 9/11. In our algorithmic age, Zellen focuses on the contributions that technologists working across many disciplines have made in developing a new type of security, filling the vacuum left by those attacks. As in his previous books, the level of analysis is the individual - but here with an added dimension: the social networks in which individuals are embedded and lead their lives. These networks are now made visible and easily accessible through the proliferation of mobile technologies - and these technologies have emerged as a key aspect of the drive to restore security."